For the June daring bakers challenge Rebecca from BakeNQuilt.comchallenged us to make Charlotte Royale and Charlotte Russe from scratch. Savory or sweet Charlottes were definitely tasty showstopper. I chose to do a charlotte royale. A sweet one. Obviously. A caramel and passionfruit swiss roll paired with a caramel bavarian cream. But really, I want to do it all again with more flavours! The possibilities are endless and have definitely got my neurone firing (nerd speak for brainstorming). Position the oven rack in the lower third of the oven and preheat oven to hot 450°F/230°C/gas mark 8. Grease the jellyroll/sheet pan and line it with parchment and then grease it again and flour it. You may use baking spray with flour included if desired. In a small bowl, whisk together the cake flour and cornstarch. Separate 2 of the eggs, placing the yolks in one large mixing bowl and the whites in another. To the yolks, add the 2 remaining eggs, and ½ cup of the sugar. Beat the yolk mixture with the paddle attachment on high speed for 5 minutes or until thick, fluffy and tripled in volume. Beat in the vanilla. Sift ½ the flour mixture over the egg mixture and fold it in gently but rapidly with a large balloon whisk (see notes), slotted skimmer spoon or rubber spatula until the flour has disappeared. Repeat with the remaining flour mixture. Beat the egg whites with the whisk attachment until foamy, add the cream of tartar and beat until soft peaks form when the beater is raised. Beat in the remaining 1 tablespoon of sugar and beat until stiff peaks form when the beater is raised slowly. Fold the whites into the batter and pour into the prepared pan, using an angled/offset metal spatula to level it. Bake for 7 minutes or until golden brown, a cake tester comes out clean, and the cake is springy to the touch. While the cake is still hot, you will need to set aside a piece for the base and roll the remainder in a towel as described below. Cut off a piece from one of the ends just wide enough to cut the top from later as shown in the photo below. Set this piece aside to cool. After this piece has cooled, cut it with shears or a sharp knife into the circle for the Charlotte base. While the cake is still hot, roll the remaining piece of cake up tightly in the dishtowel. Roll from the longest side with the darkest side of the cake on the inside. Cool the rolled cake/towel on a rack. When ready to fill, gently unroll the cake and leave it on top of the towel. Spread up to ½ cup of curd in a thin layer on top of the cooled cake and drizzle with caramel sauce, leaving it on the towel. Roll up the cake as tightly as you can about 1/3 of the way and then use the towel to pull the roll towards you and press on the other side of the roll with a bench scraper or your hands to help make the roll tight as you continue to use the towel to help roll the cake all the way up. The completed roll should be about 2” (5 cm) in diameter. It is important to get this roll as tight as possible as you do not want gaps in the spirals. Wrap the roll tightly in plastic wrap and then foil and freeze until firm enough to slice, at least a couple of hours. Refrigerate the mixing bowl for whipping the cream. Have ready a fine strainer nearby, suspended over a small bowl. whisk together the sugar, salt, gelatin and yolks until well blended, using a wooden spoon or mixer. In another small saucepan heat the milk and vanilla bean to just below a simmer (170°F/77°C – 180°F/82°C). There will be steam rising off the milk and there may be some small bubbles but it will not be at an active simmer yet. Stir a few tablespoons of hot milk into the yolk mixture to temper it. Gradually add the remaining hot milk and vanilla bean, stirring constantly. Heat the egg and milk mixture, stirring constantly, to just below a simmer again (170°F/77°C – 180°F/82°C). Steam will begin to appear and the mixture will be slightly thicker than heavy cream. It will leave a well-defined track when a finger is run across the back of a spoon. If the mixture gets too hot (above 180°F/82°C), the cream can curdle. If this happens, immediately pour it into a blender and (with the vent open or a towel over the top) blend it to try to bring it back together smoothly. Immediately remove from the heat and pour the mixture through the strainer (unless making the orange or lemon variations), scraping up the thickened cream that settles on the bottom of the pan. Remove the vanilla bean and scrape the seeds into the sauce. Stir until the seeds separate. If time allows, chill the pastry cream in the refrigerator for about 1½ hours (checking frequently and stirring occasionally) until whisk marks barely begin to appear when stirred. For faster results, cool the sauce over an ice-water bath, stirring with a whisk, until whisk marks barely begin to appear. The mixture will start to set around the edges but will still be very liquid. In the chilled bowl, whip the cream until it mounds softly when dropped from a spoon. Whisk the Baileys and caramel into the pastry cream and then fold in the whipped cream just until incorporated. The mixture will be soupy, like melted ice cream. Lightly oil a 6-cup (1½ litre) round bowl or mold (the smaller the diameter at the top the better) and line it as smoothly as possible with plastic wrap, leaving a small overhang. Measure the diameter of the bowl and make note of it. You will need a round cake base of this size for the bottom of the Charlotte. Note: If the diameter of the top of your 6 cup bowl is very wide, you may want to make an additional 1/2 recipe of the cake in a smaller pan to make sure there is enough for the roll as well as the base. Alternately, you can use a smaller bowl. When the roll is firm, cut it into ¼ inch (5 mm) slices with a small, serrated knife. You want to get as many spirals as possible, so be careful to evenly cut the slices as close to ¼ inch (5 mm) as you can. Work quickly so the cake roll doesn’t thaw and soften too much. To line the bowl, place 1 slice in the center and place other slices around it as tightly as possible to try to avoid gaps. Cover the lined bowl tightly and place it in the refrigerator until the filling is ready. Make the Bavarian cream and spoon it into the lined bowl until it comes up to the top of the bowl or just to the place the top spirals last touch each other. Trim the top spirals even above the cream if necessary. 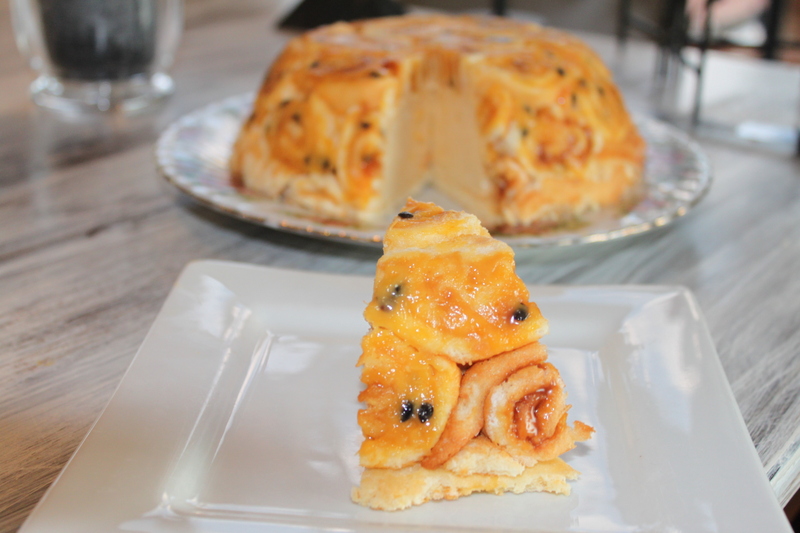 Place the cake round on top of the cream and touching the edge of the spirals. Press down gently on the edges of the cake circle so it makes contact with the edge of the spirals. Cover tightly and refrigerate until set, at least 8 hours. To unmold, invert onto a plate and lift away the bowl, tugging gently on the plastic wrap to release it. Family gatherings are a great opportunity to surprise and please people with lovely food. I had a relatively uneventful day putting together this trio and they were well received. Despite not being able to find glucose syrup anywhere (I walked stores flat for more than two hours! 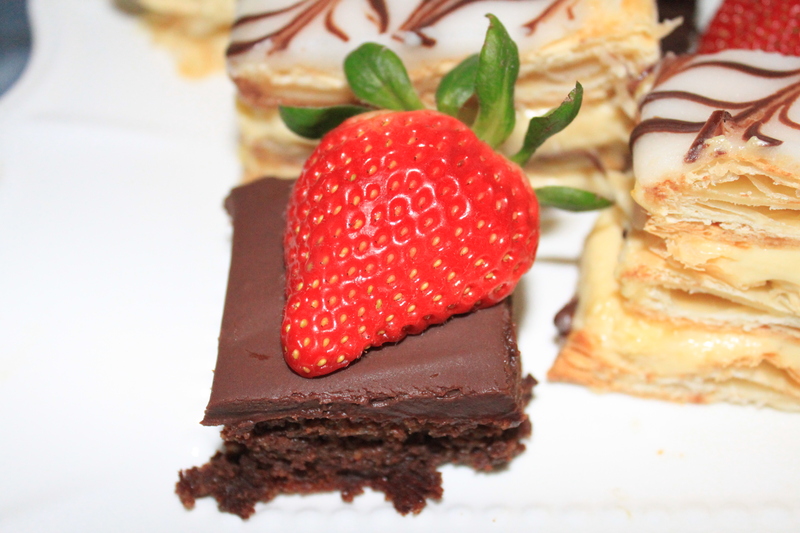 ), even my fondant for the mille feuille was pretty good. 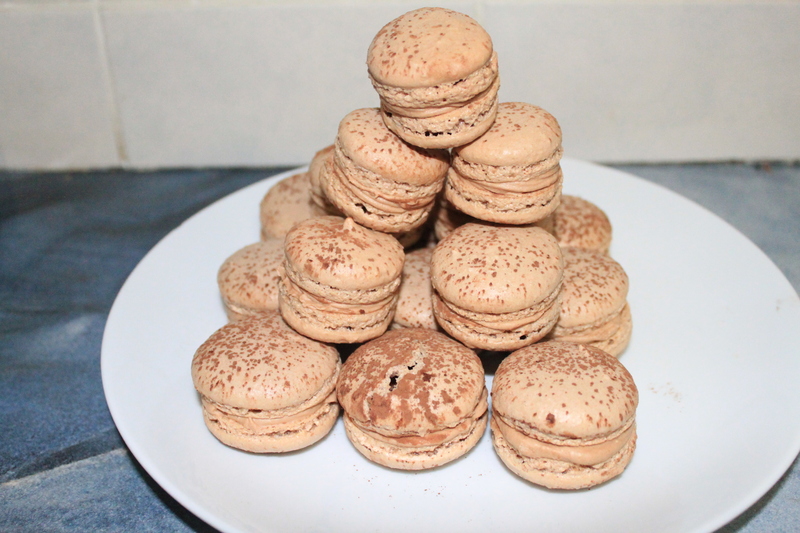 I’ve refined my macaron recipe yet again! I’ve switched to an italian meringue recipe, which seems to be more stable. I love italian meringue! So fluffy and silky, there’s almost nothing more satisfying than perfect meringue. And my macarons worked perfectly in my aunt’s oven. Yeah, it went well. The chocolate cake is squiggly and intense and full of hidden veggies! aubergine was the star here! topped with chocolate ganache and fresh strawberries, this just popped on the plate. I’ll post the recipe for the macarons and the chocolate cake here, as I have already done a post on my mille feuille before. whisk the butter until light and fluffy, add the icing sugar and continue to whisk to a paste, add the cream cheese and the chocolate and whisk to combine. 4. once the chocolate is completely melted, blend until smooth, then fold through the other mixture. So chocolate and orange has been on my mind for quite literally months. 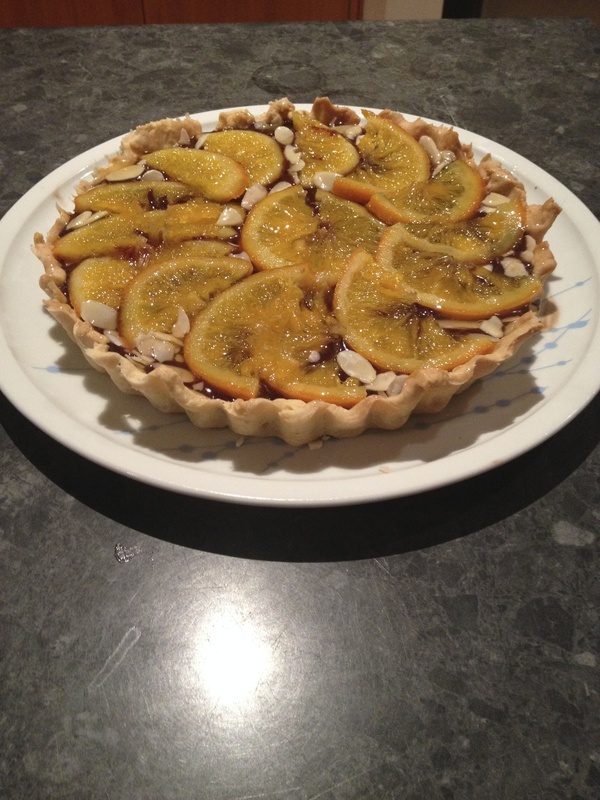 Pretty much ever since trying a gluten free chocolate orange and hazelnut tart at work; yum! It made me remember how much I love chocolate and orange, especially the ones that come in a tin of Quality Streets. I wasn’t quite sure what form my desired flavour should be expressed in, and therein lies the reason its taken me so long to create this. I kind of wanted to do a cake, but I do sooo many cakes- no seriously, ask everyone I know. But a couple of weekends ago, i was home alone, with nothing much to do, and my parents were hosting a lunch the following day so I decided to make a dessert for them. Something sophisticated, decadent and seasonal (chocolate and orange seems so autumn, its probably the colours). ell filled with marmalade infused chocolate ganache and topped with almonds and candied orange, brushed with orange syrup. My dad swears its the best thing he ever tasted… And yeah I think its pretty good too. If I made it again, I’d up the marmalade in the ganache as most of the orange flavour seemed to come from the candied oranges. And maybe a nice twist would be an addition of Grand Mariner or Cointreau. Place baking paper onto of the pastry and fill with ceramic pie weights, uncooked rice/beans. Bake at 180˚C for 25 minutes. After 10 mins remove the weights and baking paper. Your shell should be just browned and crispy. Add the slices and cook over a moderate heat for 20 minutes. Cook for a further 15 minutes or until the syrup has reduced to a thick syrup and the oranges are tender. Mum held a lunch for her friends and their kids yesterday as a start to school holidays. She never does things by halves and this was no exception. The menu included and was not limited to; sausage rolls, quiches, chicken and salad, followed by meelktart, lemon meringue pie and chocolate éclairs. This is a fair bit for one person and so, I offered my assistance, despite not actually being around for the lunch. Selfless right? And there may have been a burning desire to attempt éclairs again…. I also made the lemon meringue, but I’ll reserve that recipe for when I make a prettier one. Now, choux pastry can be temperamental and unpredictable. The same recipe can result in little fluffy cases or flat lifeless pancakes. And of course, it helps if your recipe contains the correct quantities… yeah, it was one of those days. 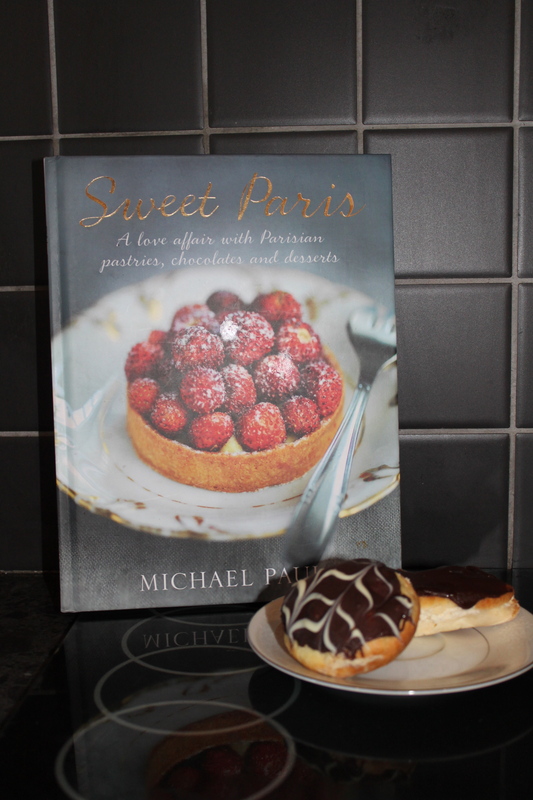 I decided to branch out and try a new recipe from Michael Paul’s book, Sweet Paris and adapted it slightly. It called for 4 eggs, which I thought was a bit excessive regarding the quantities of the other ingredients, so I cut it to three. Also the temperature was 180˚C, which I changed to 220˚C for the first 10 minutes and then drop to 185˚C to encourage rising. They were pretty good as shells, but not perfect yet. Mum always used to do chocolate glazed, whipped cream filled éclairs, but I wanted to try a crème pâtissière, so I settled for some whipped cream filled, some vanilla crème pâtissière filled and some chocolate crème pâtissière filled. The éclairs were the most popular, and the chocolate filled ones went the fastest. One boy even said they were the best thing he had ever put in his mouth. I call that success. Add the flour and stir until smooth and forming a ball. Take off the heat. Add the eggs one at a time stirring vigorously each time. They should rise up like miniature loaves of bread. Gradually pour the hot milk into the egg mix, while beating. Slow at first to avoid scrambling the eggs. Place cling wrap directly on to crème to avoid a skin forming refrigerate until use. For the chocolate crème; use half the crème, add 15g melted chocolate and 1 tsp cocoa powder. Make a small hole in each, at the bottom or the side, pipe the selected filling into the éclair gently until full. Melt 150g dark chocolate. spread the top of each éclair. So I’m currently in the middle of study week and probably a bit too relaxed about my looming exams. Instead of hitting the books, I’m planning beach trips, designing houses that will never be built, riding, and baking of course. Free time as well as a bout of the flu over the weekend drew me into the kitchen on sunday. Monday was spent recovering. Tuesday was meant to be a productive day of study and ABSOLUTELY NO BAKING. I swore to myself the most i would do was make toast. Things were going well, I had cleaned out my study (the number of papers that can build up during folio week is astounding) and my bedroom was next. Then my mother came home, bearing a well intentioned gift of cute pink cupcake cases… Alright, just one batch of cupcakes; one hour maximum. Before I had even voiced my intention, she pulled out a box of brandy snap baskets and expressed a desire for some sort of custard filled brandy basket dessert. I was now gone. A day that was meant to be kitchen free was suddenly filled with 2 batches of crème pâtissière, 2 batches of macarons, ganache and raspberry coulis. Exhausted does not even begin to describe my state. The first batch of custard split, so onto the next. which left me with 10 egg whites. all my macarons failed (I had about 3 egg whites left at the end of the day which became the perfectly formed beauties in my previous post). However, crème pâtissière is quite marvellous and is a base for many french desserts. In this case I paired it with a raspberry coulis in the brandy baskets. Whisk the egg yolks and the sugar and gradually add the flour and cornflour. Heat the milk and the vanilla bean until almost boiling. Gradually add the milk to the egg/flour mix, while hand whisking (it helps to have two people at this stage). Transfer back to the stove, whisk until thickened and boiling, then for a further 2 minutes. cover with a sheet of cling wrap and refrigerate until cool. Just before serving, whip up some cream and add to the custard, until smooth. Serve, in this case in brandy baskets with a raspberry coulis. water (as it boils)Place all ingredients in a saucepan on low heat for 30 mins until reduced.